We punch out a piece from a metal plate and then bend it. 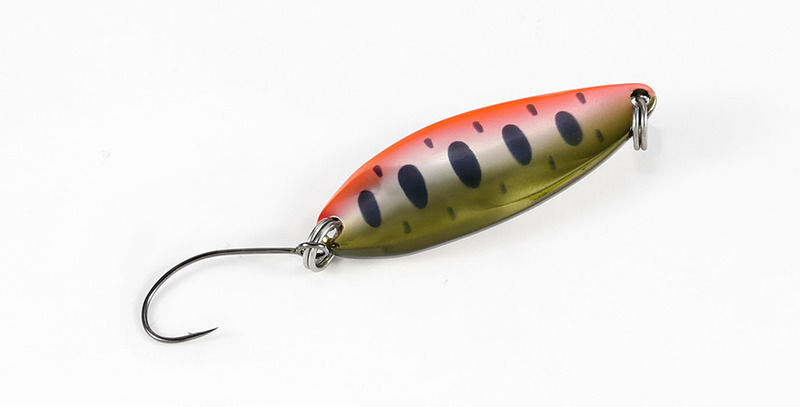 In other words, this simple “pressing” process of the one piece lure is the heart and soul of the lure. Our objective was not to create an average “Straight A student” but an outstanding character with a difference. By shaving off the edges of the side, giving the lure some variance in thickness and focusing the center of gravity in the deepest section of the spoon, we were able to achieve our goal of creating a unique action. The acute angle of the initial retrieval produces a “flattering” and “flashing” effect, switching on those fish in the surrounding waters. Anglers will be able to trace a specific depth with its outstanding range controllability. We hope you can first handedly experience the “Gambrel” in the field to appreciate its unique distinction.